May is Bike Month NYC, according to Transportation Alternatives, so it's a good time to report on a trip up and down the Seine with my wife Alice using the Velib' ("Velo-libre" or "free bike") system. This is the less-than-a-year-old brainchild of the socialist Mayor of Paris, Bertrand Delanoe. Paris has more than 230 miles of well-marked cycling lanes and the Velib' has been a big success with more than 20 million trips as of this month, or 70,000 trips per day. At this pace, by the first anniversary on the day after Bastille Day, July 15, the Velib' will have attracted an amazing 25 million trips. To add our two more trips to the counter, we first buy a Velib' map, sold at any newsstand. The Google map of Paris below has its green arrow pointed exactly to where we decide to join the Seine from the north. We decide to start with the bicycle route on the north (right) bank of the Seine headed east, ride this until the Seine-side bicycle path ends (it goes north), then cross over the Seine and take the bicycle path west on the south (left) bank to the Branly Museum. It goes more or less as planned. We walk to the nearest bike station to where we are staying, a bank of about 20 bikes on rue Bachaumont, between Montorgeuil and Montmartre. Parisians and visitors can pick up and drop off bicycles throughout the city at nearly 1,500 locations with 20,000 bikes - an average of 13 per location or approximately one for every 900 square feet. Half the bikes are available at this station at 10 am and a testing of the tires indicates that the first two are in good shape. None of the bikes has the bicycle seat turned around, a signal to other users to avoid the bike and a signal to JCDecaux staff to please fix it. To unlock a bike, we must go to the muni-meter at the bike station. Despite the "free bike" name, the bikes are actually not free. You must have a credit card. What is free is that: (1) You can put the bikes back in any bike station and then forget about them - a big plus. (2) The per-hour charge doesn't start until after half an hour. One issue is the "Montmartre" problem - people pick up bikes at the top of Montmartre but don't ride them back up the hill. It's as though there were free toboggans and - surprise - people pick them up at the top of the hill and check them in at the bottom. Until this problem is addressed (maybe you get a 5-euro credit if you drop the bike at the top of the hill? ), a JCDecaux truck is shlepping the bikes from the bottom of the hill to the top. We frankly have a little difficulty with the muni-meter as may be seen from the two photos. It requires not just inserting a credit card but answering a series of questions. It's francophone only and my vocabulary alas does not include some of the words the machine uses. It's not as U.S.-user-friendly as most ATM machines in Europe, which allow one to click next a Union Jack to indicate you would like instructions in English. One-third of Velib' users come from outside of Paris and probably an increasing percentage of them will be foreigners. We are lucky to have with us our Parisian friend Edith, who kindly guides us through the muni-meter operation. We buy a 7-day card. I expect that when the next edition of the muni-meters are installed they will have an easier system as the potential for use by tourists becomes more evident. It would also be helpful to have a way to rent helmets, which we use when we cycle in the United States. Next time we go to Paris we may bring our own helmets. Once we have our cards, releasing the bikes is simple. We place the card on a marked spot on the bicycle dock until it flashes green and then we remove the bike by pulling it out of its dock-lock. We repeat the process for bike #2 and we are on our way to "chercher la Seine"! One reason for women being more confident on bikes in Paris is that the bike lanes are well-thought-through. Mayor Mike Bloomberg has been adding some such paths in New York City, for example a fine new stretch on Ninth Avenue between 23rd and 14th Streets. The Velib' bikes have three speeds. Neither of us had any trouble shifting or maneuvering them. Sunday was a good day to get started because the traffic is less hectic than on a weekday. The car drivers were surprisingly respectful of bikes. Our biggest problem was with engine-aided cyclists, who appeared out of nowhere and seemed oblivious of cyclists, their attention being focused on the four-wheeled threats to them. We cycle down rue Montorgeuil, a lovely street in the pedestrian-only, "Pietons" area in the 2nd Arrondissement. This area preserves the old Paris with its many small shops. We stop to admire a fruit store and a bakery, then go over to Blvd. de Sebastopol and down to the Seine. The views along the Seine are soothing to the soul. Parisians are intensely proud of their buildings and vistas and rightly so. One nice feature for bicyclists is that Mayor Delanoe keeps the streets very clean. We saw only one empty bottle not in a trash can during the entire bike trip and within five minutes of my pointing it out as an oddity to Alice, it was picked up by one of Paris's ubiquitous mini-sanitation trucks. Our leisurely trip consumed about three hours. We ditched the bikes at a bike station on the Seine right near the Musee du Quai Branly, where we spent a couple of hours looking at the arts and crafts of early civilizations in Asia, Africa and Latin America. We had a fine lunch at the Brasserie du Tour Eiffel and returned home. I'm indebted to Edith for the photos and to Paul DeMaio and his Bike-Sharing Blog, on which I have relied for some of the numbers I cite. He reports that 94 percent of Velib' users like the service and 17 percent are 46 years old or over. His website also has a rundown on bike-sharing programs in an astounding number of cities round the world. 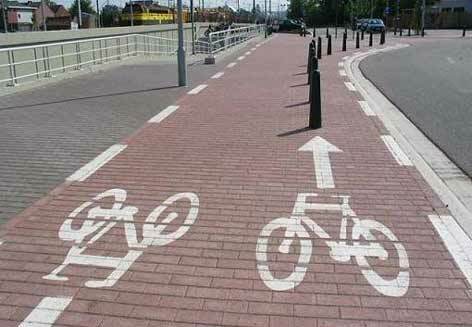 To wrap up this post, I thought I would show an example of a well-marked bicycle path (not in Paris) that unfortunately would be very hazardous on a dark and foggy night because one of the arrows gives false promise of a clear route ahead! We should encourage our municipalities to create safe bicycle paths. At the same time we should be minimizing the risks we take by putting safety first (helmets for us next time). Happy Bike Month, NYC and Paris!